We were invited to be inducted on the 9th into the American Classical Music Hall of Fame in Cincinnati, to join so many luminaries of American music. Very exciting. The complexities and expense of air travel being what they are, we elected to drive - quite a distance, but beautiful - from Lexington, Virginia where we had performed the night before. 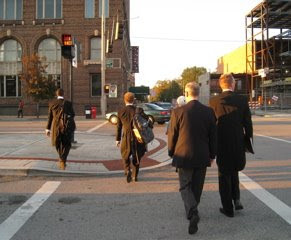 Byron Gustafson, our representative at Opus3 and Peggy Skornia from our Board of Trustees walked with us through a beautiful mid-western evening to Memorial Hall where the Hall of Fame is located.